Our Medford cosmetic dentist Dr. Ryan Clancy uses advanced laser technology to help treat a variety of medical and cosmetic dental issues, including "gummy" smile and some types of gum disease. Dental lasers are safe and effective, and have a number of benefits over traditional dental treatments using a scalpel. We will be happy to discuss laser dentistry with you during your consultation. Give us a call at 781-396-8558 to learn more about the types of laser dentistry treatments we offer and schedule your appointment at our Medford office. 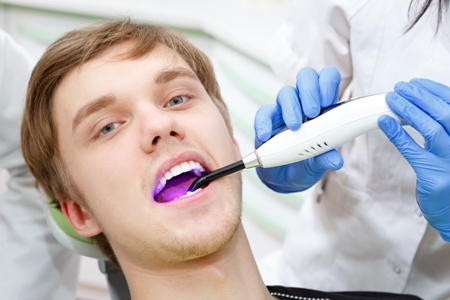 Laser treatment has become common in the medical, aesthetic, and dental fields. As laser technology becomes more sophisticated, it can be used to treat more issues safely and efficiently. Since a laser cauterizes as it cuts, there is significantly less bleeding involved in a procedure such as gum contouring. In addition, because of this cauterization, there is less of a chance of infection following your surgery, and recovery is often much easier and faster. Gum recontouring is a popular procedure used to reshape the gums into a more even and aesthetically pleasing appearance. It is a good choice for patients who have what's known as a "gummy smile," where the gum line extends so far down the teeth that it is visible when smiling. A gummy smile can also create the illusion of having unnaturally short teeth. Gum recontouring exposes more of the tooth for a more attractive smile. If you are bothered by the appearance of your gums, ask us about gum recontouring and if you are a candidate for the procedure. Crown lengthening is similar to gum recontouring, but is specifically performed when more of the tooth needs to be exposed in order to properly place a restoration such as a dental crown or filling. This can happen if, for instance, a tooth breaks off right at the gum line, or if there is significant decay throughout most of the tooth. A frenum is a piece of connective tissue or muscle. In the mouth, there are two types of frenum: labial and lingual. The labial frenum connects the upper lip to the center of the gums, while the lingual frenum connects the bottom of the tongue to the floor of the mouth. A frenectomy partially severs this connection in cases where it causes problems. In children, the frenum connecting the tongue and mouth floor can be too far forward, which causes problems with speaking and eating. This condition is sometimes called being "tongue tied." Severing the frenum in this case can help children move their tongue more freely, and thus allow them to eat and speak properly. The frenum connecting the upper lip with the gums can cause problems by creating a large gap in between the teeth. It can also cause gum recession due to pulling the gums up over time. A lingual frenectomy can help reduce the gap and prevent excessive recession. If your gums are infected, a laser can be used to help remove bacteria and sterilize the "pocket" between your tooth root and gums. Typically, this pocket is fairly shallow, but in cases of gum disease, it can become much deeper and trap bacteria and food debris that you can't reach by brushing. After we sterilize the pocket with a laser, we will deep clean your tooth root and create a smooth surface for your gums to reattach to. To learn more about laser dentistry and find out if you are a candidate, call Dr. Clancy today at 781-396-8558 to schedule your consultation. We serve patients in Medford and surrounding areas of Boston, including Winchester, Somerville, and Cambridge.